Combine visits to Mostar and Medjugorje, Herzegovina, on a full-day tour from Split or Trogir. Learn about the mix of Eastern and Western culture in each destination through a guide's engaging commentary. 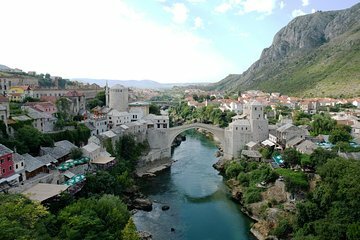 Explore Mostar's old bazaar and the Turkish bridge; visit the famous pilgrimage site in Medjugorje. Round-trip transportation from Split and Trogir included. The tour was a fun and eye-opening experience for me and my wife. Our tour guide, Victoria, was very knowledgeable, organized, friendly and courteous, and her English was excellent she explained that she had spent some time in Canada in the past. We learnt a lot about Mostar, Croatia and Bosnia and Herzegovina from Victoria. She also spent time talking extensively with each of the six couples in the tour group throughout the tour making all of us feel relaxed and at ease. My wife and I thoroughly enjoyed the tour and the time we had talking to Victoria. Much too much time catering to people with specific religious wishes. Guide barely spoke English. The trip should be advertised as for devout Catholics only. Mostar was fine.